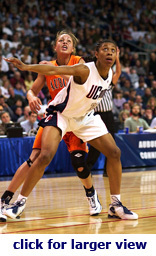 Jessica Moore was a Center for the UConn Huskies from 2000 – 2005. She was a key member of three National Collegiate Athletic Association Championship Teams, established an NCAA women’s basketball record with 70 consecutive wins, played in every game of her career (145), and finished her career ranked third all-time in field goal percentage (.584). Jessica was selected 24th in the Women’s National Basketball Association Draft in 2005 by the Charlotte Sting and currently plays for the Los Angeles Sparks. I had the pleasure to meet Jessica while her WNBA team was in Connecticut for a game in June 2007. By the time Jessica reached Colony High School in Palmer, Alaska, she a good all-around athlete. She was on the basketball, track and volleyball teams. The basketball team reached the state finals four times winning the State Championship twice, and the volleyball team also won two State Championships. Jessica was voted Alaska’s Athlete Of The Year her junior and senior high school years. Her most memorable experience from high school was winning her first of two State Championships in 1998. “It was a really, really big deal, we had a great season and you can’t imagine anything better than that.” During her high school summer breaks, Jessica continued improving her basketball skills. Her high school team traveled to basketball camps in the lower 48 as they referred to the rest of the United States for half of the summer. A coach from an Athletic Amateur Union (AAU) team in Oregon spoke to Jessica’s high school coach, inviting her to play for his team during the second half of the summer. This team traveled all around the country, offering her great exposure. During her sophomore, junior and senior summers, she spent half of it with her Alaska team, and half playing, and living in Oregon. One very memorable game for Jessica was when UConn went to Duke for the first time. It was the number one team in the country versus the number two team in the country. There was so much hype and media for that game. UConn was not expected to win but did at the historical Duke gym. During the off season of the WNBA, Jessica goes to Europe to play basketball. Her first year in Europe she and UConn teammate Ashley Battle went together to play in Spain for a team called Universitario de Ferrol. Neither one of them had ever spent much time in Europe; neither knew the language so it was comfortable to go with someone you knew. Her second year in Europe Jessica played in France for Challes Les Eux where her team reached the playoffs, and qualified for the Euro Cup for the following season, which is a goal each team tries to reach.